Peoria, IL (June 9, 2014) – The Board of Directors of the Downtown Development Corporation of Peoria (DDC) has announced the appointment of Michael Freilinger as President of the newly formed DDC. Freilinger will assume responsibilities beginning on June 9. Freilinger has been serving as Tazewell County administrator since April 2012. During his time at Tazewell County, Freilinger developed the first strategic plan for Tazewell County, successfully negotiated an expansion agreement with Monsanto for a $25 million expansion, and helped develop a solution for the Pekin landfill. Freilinger’s career over the last 25 years includes more than 10 years in executive leadership positions covering economic development, strategic planning, fiscal management, and downtown redevelopment. Prior to serving in Tazewell County, Freilinger served as Senior Partner at Strategic Solutions Partners, County Manager for Osceola County, Florida and County Administrator for Polk County, Iowa. In Osceola County and Polk County, Freilinger is credited with recruiting new and expanding existing businesses, generating hundreds of new jobs in Osceola County and over 2,500 new jobs in Polk County. In early 2013, CEO Council members agreed to take on downtown-warehouse development as one of their initial areas of focus. 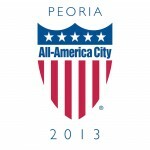 Research showed that Peoria may be the largest American City without a downtown organization. Best practices suggest that having a DDC is effective for accomplishing the goals and objectives of a downtown redevelopment effort. The CEO Council successfully launched the DDC as a stand-alone organization to serve as the leading entity to guide and sustain development in downtown Peoria. The DDC will ultimately become the organizational toolbox to coordinate development, management, marketing, and be a champion for development in Peoria’s downtown and warehouse district. · Serve as the leading organization that champions, guides and sustains growth in Peoria’s downtown and warehouse district through best-practices in relationship, business and economic development. · Address the supply of suitable downtown housing, recognizing the significant demand. An independent report estimates the need for 200+ units per year, for at least the next 5 years. · Champion a pedestrian friendly environment in support of residential, business and economic growth in the downtown area. · Foster a thriving – live, work, play – environment attractive to those seeking a vibrant urban community. The Board of Directors of the DDC will include representation across various industry sectors. The founding organizations and members of the DDC Board are named below. The DDC was organized in 2013 and is a 501(c)3 not for profit stand alone corporation. The DDC serves as the leading organization to guide and sustain development in Peoria’s downtown and warehouse district. For more information and to schedule an interview, please contact Michael Freilinger at 309-369-6038. View the full press release here.